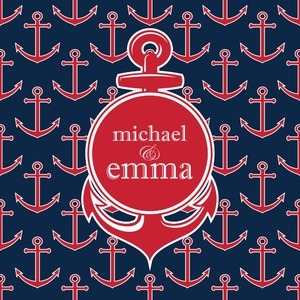 If you love anchors, then this design is for you. It is call all anchors for a reason! 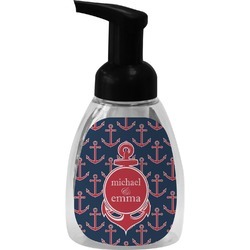 - Anchors int he background and a beautiful anchor for the label; and we have chosen to use couples personalization - you can change it to anything you like, monogram, name & initial or just a name - the choice is yours. We chose to use the classic nautical colors of navy blue and red, however, the design is fully re-color-able, so if you would prefer pink and purple or royal blue and red - the changes are easy. You can change it to any colors that you desire. We also chose the anchor label with a couples personalization - you can stay with it or choose from the many labels in our system - maybe a rope label? So try out our customization system and see what you come up with.